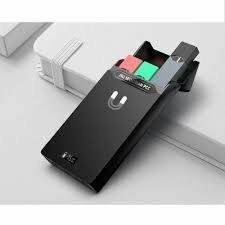 UpTown-Tech Jili Box is a brand new device by Uptown tech that has a 1300mAh battery backup, and is designed to charge your JUUL on the go. The JILI holds one JUUL device and two pods. An ultra-thin silhouette looks awesome from any angle. This may be the most stunning PCC ever designed for JUUL. UpTown-Tech Jili Box has made the device with two LED screen readouts, to provide the user information about how much charge is left in the PCC as well as how much time left to fully charge your JUUL. Additionally, this PCC is thin enough to slide into your pocket and resembles a pack of ultra-slims. The JILI is a personal charging case with personality. Inspired by analogs, the PCC is the shape of an ultra-slim pack of cigarettes but is loaded with technology. Meant for use with the JUUL vape device, you can re-charge your JUUL on the go with JILI!